It seems like an easy one! I mean what could be so hard about area range and summary address command? You will be surprised how many people tend to forget this things or to apply them when not necessary or even worst where is their place to be added. It’s basic knowledge, but sometimes exactly this basic knowledge give us headache. You will find situation when only one physical device will be ASBR and ABR router. The functionality and rules remain the same, just that instead of having 2 device you have only one that connect to another non-OSPF domain and in the same time to multiple OSPF areas. Why we would use this 2 commands? Well one simple explanation is that we want to summarize advertised subnets to reduce the total number of routes present in the routing table. Less routes means less overhead and load for a router. Let’s have a look to the routers presented in the above topology. The dynamic IP routing protocols (EIGRP and OSPF) are already configured and functional. For the IP network clouds, I have used Loopback interfaces. On R1 the 2 IP subnets (192.168.1.0/24 and 192.168.2.0/24) are present in EIGRP routing protocol. As well on R3, the IP subnet between R2 and R3 is present in OSPF area 0 (zero) and the other 2 subnets (10.10.1.0 /24 and 10.10.2.0 /24) are in OSPF area 1 (one). Now, if you remember from my older post, if you have a Loopback interface with a IP address (doesn’t matter what netmask) this will be always advertised in OSPF as /32. I did a little trick to be sure that they are still advertised in OSPF as presented under Loopack 1 (10.10.1.1 /24) and Loopback 2 (10.10.2.1 /24). You want to know how, check this post. Until now, we saw how the routers are configured. Let’s have a look how the routing table appear now on this routers. Among other routes, please notice that we receive the 2 networks from R3 each of them with a /24 prefix. Keep this in mind as it’s important for later. On R2 we have both the EIGRP and OSPF routes, each with a /24 prefix. In some minutes we will change this. Let’s check the last router. Here we have the 2 prefixes from EIGRP domain, again with /24. After reviewing all the necessary information let’s apply the configuration. I will start with Area range command. For example in our case we want to advertise only one subnet from Area 1 to Area 0 in OSPF. We will combine the 2 x /24 subnets in one /22. Why /22 and not /23? Because we have 10.10.1.0 /24 and 10.10.2.0 /24 and 10.10.1.0/23 will not be a valid prefix. Keep in mind that you have to stick to the subnetting rules. Indeed with this /22 we will “catch” also 10.10.0.0/24 and 10.10.3.0/24 in our range, but being in a test environment this is not a problem for now. In the real world you have to take care about discontinuous networks and to apply summarization only when it’s possible. Only one /22 subnet. IP subnet summarization is successfully taking place. What about Summary address command? Remember that we redistribute from EIGRP into OSPF, so if you have a look about, right now in the OSPF cloud we have 2 /24 subnets imported from EIGRP domain. We want to summarize this 2 addresses in a /22 (the same reason like explained above). For this we will use the Summary address command. In short explanation, this command is only used on ASBR routers, when you want to summarize IP subnets imported from a non-OSPF domain. We could see clear the advantage. Summary route 192.168.0.0/22 is present on R3 and again 10.10.0.0 /22 is on R1. This is the nice part and we achieved what we wanted. What about the blue line? That a big problem. Maybe your idea was that I did some mistake when using .1. and .2. in the third octet the subnet. It was more easier to use .0. and .1. and then I could summarize easy with /23. But I wanted to show you a hidden danger which lies beyond the summarization. Remember that I said I did just a basic redistribution between EIGRP and OSPF? Forget that! In test environment is OK, but in real ones not. Always try to reduce the amount of redistributed subnets between 2 domains to only the necessary one using route-maps or route tagging. This should be mandatory, when redistributed summarized networks which are discontinuous. Back to the blue line. 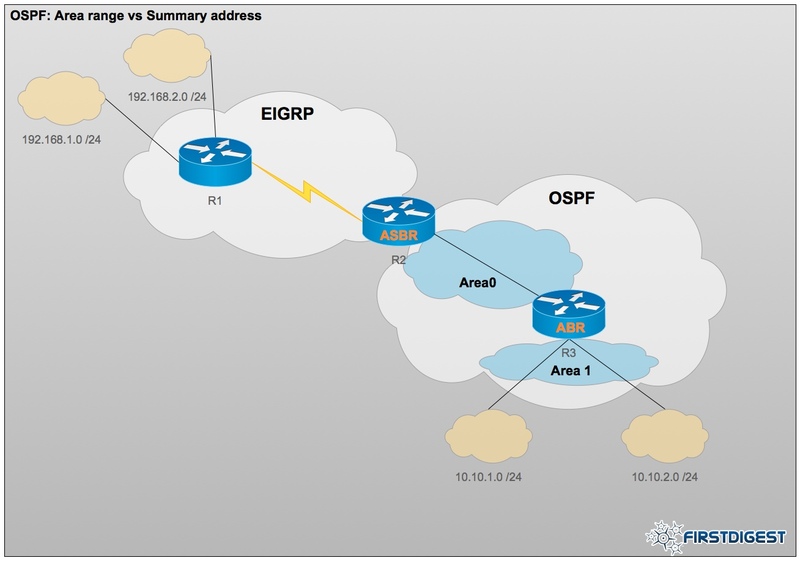 We redistribute from EIGRP to OSPF, where we did the summarization. Due to the fact that we used 192.168.1.0/24 and 192.168.2.0/24 we had to summarize to /22, which include also the non-present subnets 192.168.0.0/24 and 192.168.3/24. Then we redistribute from OSPF to EIGRP. See the loop? EIGRP-OSPF-EIGRP. Since EIGRP see there a /22 prefix which include the 2 additional /24 subnets 192.168.0.0 and 192.168.3.0 of which R1 has no clue about, the router install this route in it’s routing table, thinking that R2 is the gateway for the 2 prefixes above. It sound complicated but I tried to simplify the explanation as much as I could. If we were using route-maps or route tagging this situation could be avoided. I believe most of you are familiar how OSPF is injecting a default route in a normal area. If not, you can find here all the documentation that you need. Please be familiar with this concept before reading this article. This configuration is OK, but we can run into the following issue. Imagine that for some reason the BGP peering between PE and CE is broken (e.g. 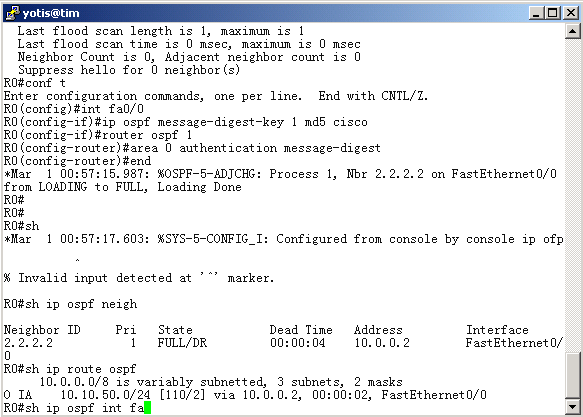 line being down), the CE router will have no clue about this and will still propagate the default route to the Core. 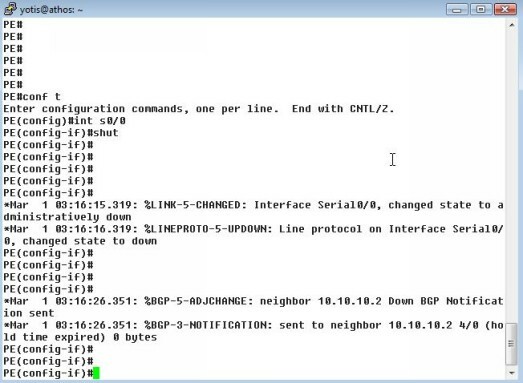 In this situation, the Core will still forward all the packets without specific route to CE where it will have no further route to reach the destination, as the CE does not receive any route from the BGP peer. As you can imagine is better to avoid this situation, especially if for some reasons you are not monitoring the connection between PE and CE and you cannot react to change manually the route in case of a failure. We are lucky because some smart engineers have developed a solution to avoid this problem, called Conditional inject of a default route in OSPF. With this solution, OSPF is monitoring the reachability of the point-to-point IP connection between PE and CE. 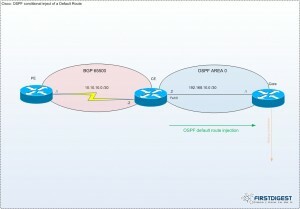 When OSPF process on CE router notice that the IP connection is not available anymore, it automatically retract the propagation of the default route to the Core. The solution is simple an assume use of an ACL or prefix-list then match this on a route-map and finally use this route-map under “router ospf” process. For step-by-step configuration check below. Now, the OSPF process on CE will inject a default route to the Core as long as the IP subnet between CE and PE is reachable. IMPORTANT NOTE: This solution might not work if your connection from CE to PE is Ethernet and not Serial like in the example. I will explain why on the next post, when I’ll achieve the same behavior but using EEM together with an Ethernet based connection instead of a Serial one. 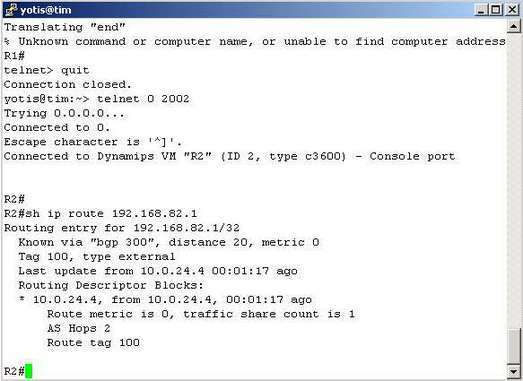 In the previous post I explained some basic stuff about IPv6 and how to configure IPv6 addresses on Cisco’s interfaces. Following this subject, I want to explain now how you can configure unicast dynamic routing protocols for IPv6 networks. The same as IPv4, the v6 generation of IP addresses supports routing protocol like OSPF, RIP and EIGRP, just that their names has been adapted to the v6 generation meaning OSPFv3, RIPng and EIGRP for IPv6. — OSPFv3 does not provide natively authentication like OSPFv2 does; for OSPFv3, the IPv6 structure covers this with its internal support for AH and ESP. 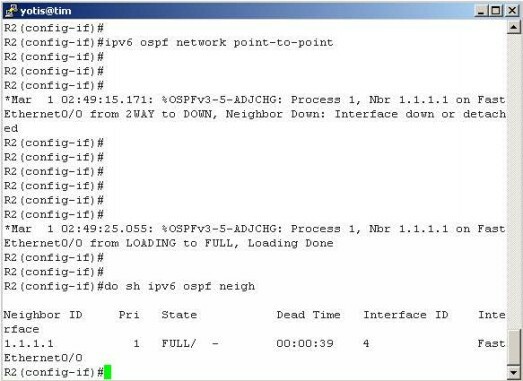 If for some reasons the tutorial above is not available for you, please check this text file which present in text mode everything needed to enable OSPFv3 point-to-point network configuration between 2 Cisco devices. Everywhere in the world people try to find the optimal path to achieve something.If we speak about roads, trips and in our case networking, choosing the best path to an end point can have only advantages. I took the term optimal / suboptimal path from the routing issues that can appear in the OSPF network environment and which are called by the experts suboptimal routing. What I want to explain here, maybe you already seen it, is that in some network environment the best path to a destination is not always preferred by the routing protocol due to some unhappy situations. To understand better what I’m talking here, please have a look at the topology that I will use for this tutorial and for the next one regarding optimal path. In the example below I will show you a simple and dirty trick how you can escape from this situation. I recommend to use this dirty trick only in urgent cases and only temporary as this can lead to more problems if you have a complex network environment. In the next days I will show you a more elegant method to escape from suboptimal path problem. As you can see in the topology we have a network environment formed by 4 routers. On R1 we have configured a BGP session with the peer R3 and OSPF with R2. Since the peers are in different autonomous systems the BGP session will be external. For OSPF this does not matter.The Loopback100 interface in R1 is advertised into BGP and OSPF, and it is learned by R2. 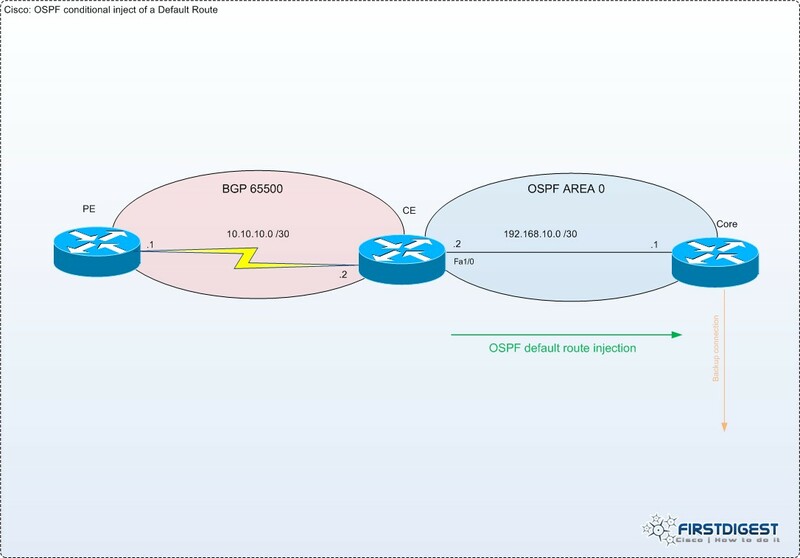 On R2 the interface 192.168.82.1 arrives on BGP table and OSPF table, but since the Administrative Distance of the eBGP (20) is better that the one of OSPF (110) on the routing table will appear the route through R4. This is bad because without considering the obvious longer path through R4, we can see that the links between R2-R4 and R1-R3 are Serial interfaces and definitely with more limited bandwidth than FastEhernet interface R1-R2 (we assume that we do no have any QoS or other limitation). Last note before we begin, all the routing processes on the devices are completely configured and functional. In a well controlled environment, false information routing should not reach your OSPF domain, as network engineer take care what to advertise and what not into OSPF. But there are cases when you have to deal with 3rd party companies somehow, and you want to be sure that nothing in injected by mistake into your domain. Also this can be a task for CCIE RS lab exam. And since I specified that this can be an exam task, let take some “DO NOT USE” rule and we have to accomplish the task above without using the command “ip ospf authentication message-digest”. Download the used topology here. R1 from the topology is pre-configured. The OSPF timers have been reconfigured to hello 1 second and dead interval 5 seconds, not to wait “forever” until it rebuilds the adjacency.